Welfare-related health inequality: does the choice of measure matter? Using representative microdata from the German Socio-Economic Panel Study (SOEP), we show that the welfare measure choice has a substantial impact on the degree of welfare-related health inequality. To assess the sensitivity of welfare-related health inequality measures, we combine a unique set of income and wealth measures with different subjective, cardinalized, and (quasi-)objective health measures. The influence of the welfare measure is more pronounced when using subjective health measures than when using (quasi-)objective health measures. In December 2011, after having bravely fought for more than one year against an extremely virulent form of cancer, Joachim R. Frick—my co-author on this manuscript—passed away. Joachim was more than just a mentor and advisor to me. I first met Joachim in July 2004. At that time, I was a Master’s student at the Berlin Institute of Technology (TU Berlin). In collaboration with the SOEP department at DIW Berlin, Joachim offered a course on how to work with SOEP data and with Stata®. This was the first time that I actually worked with microdata and I realized that research was what I wanted to do in the future. Joachim shaped the course of my life ever since. Without taking this course and without Joachim’s encouragement to apply I would never earned my PhD from TU Berlin and DIW Berlin. As I reflect back, and as I find my place in the academy, I am sure that without Joachim I would not be where I am now and would not be doing what I do now. Thanks Joachim, I will never forget. Rest in peace. We thank the editor, two anonymous referees, Cristina Blanco, Andrew Jones, Martin Karlsson, Jenny Kragl, Tom van Ourti, and participants at seminars in Darmstadt at the “Health. Happiness. 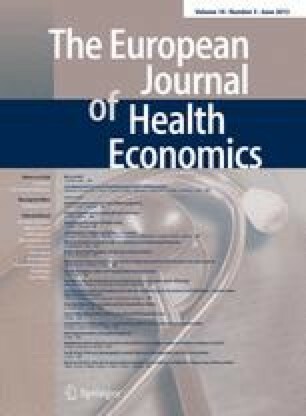 Inequality–Modelling the Pathways between Income Inequality and Health” conference, as well as in Rome at the Meeting of the Applied Econometrics Association and the “Econometrics of Healthy Human Resources.” Special thanks go to Adam Lederer for co-editing this paper.